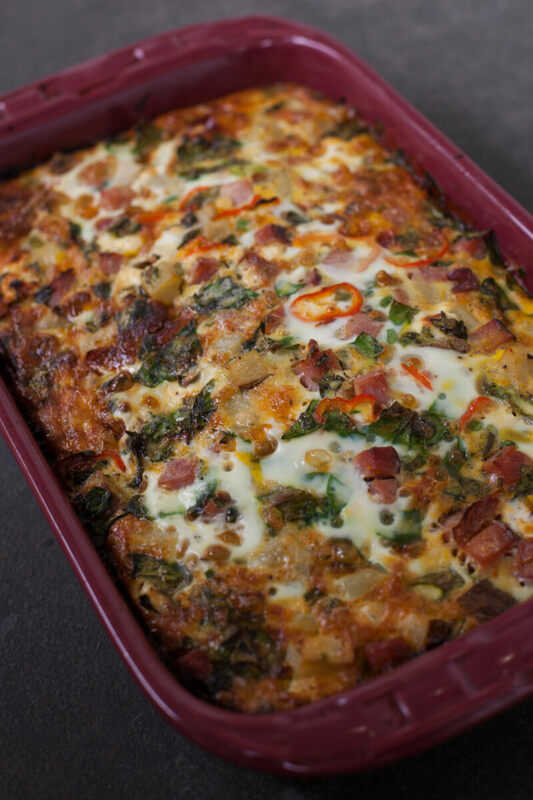 This easy overnight ham and veggie breakfast casserole recipe is the perfect solution to entertaining for breakfast or brunch, without having to spend a bunch of time in the kitchen the morning of. It’s also a great recipe for church potlucks! Oh friends. 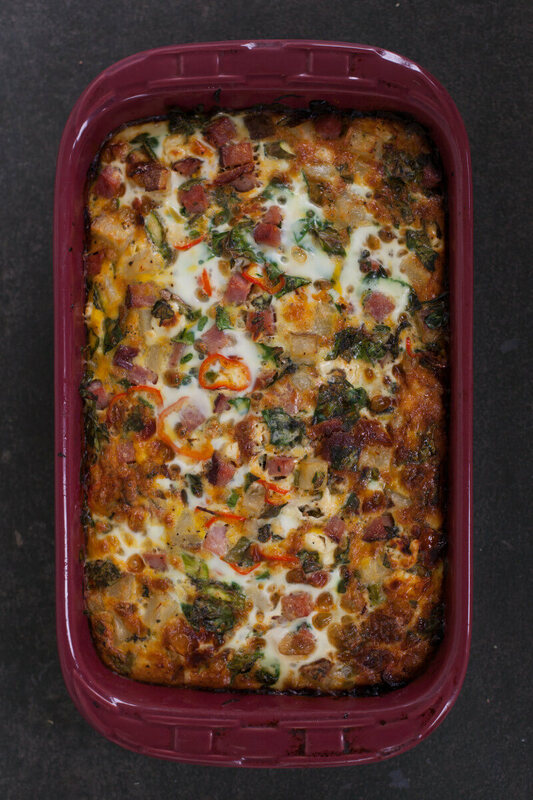 This is the easy breakfast casserole you’ve been waiting for. It is so PACKED with vegetables and herbs that each bite is different and exciting. It’s one of those kitchen sink recipes, where you can use anything and everything you can get your hands on. Well in this case it’s more like a kitchen garden recipe, because I used almost every single vegetable and herb that I have ever grown in the garden outside my kitchen window. I love breakfast casseroles. In fact I love them so much that just 7 hours after giving birth to my daughter Larkin, I showed up at my Mops group at church because I was hungry and wanted breakfast casseroles. Yes everyone thought I was crazy, and no, I didn’t care. 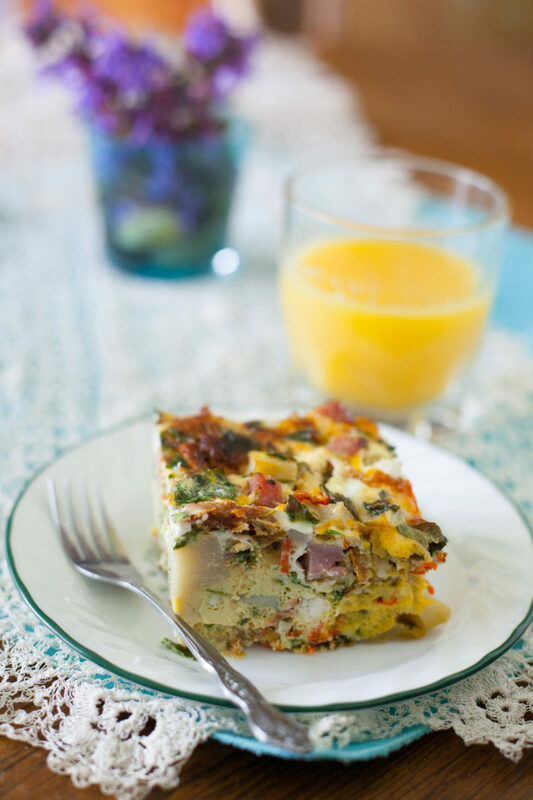 But I really love vegetable breakfast casseroles. 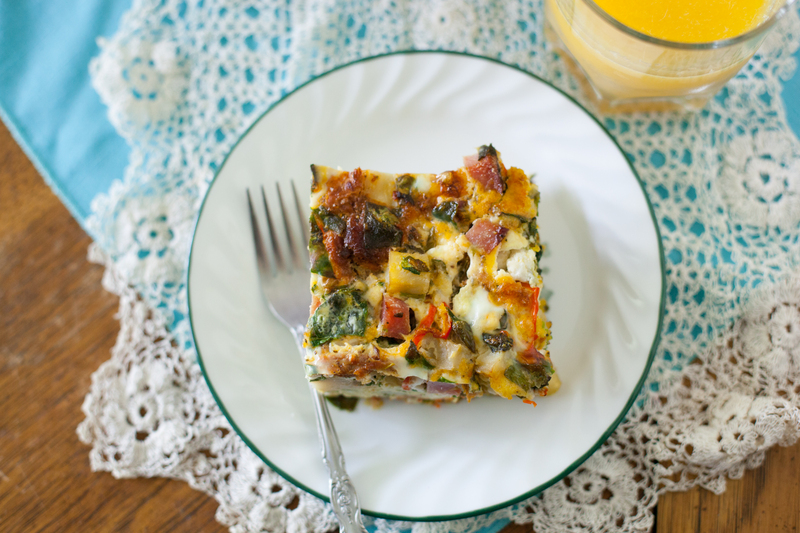 I don’t want my breakfast casseroles to be too heavy or weighted down with lots of carbs. Some bread and potatoes or hash browns is good, but there can be too much of a good thing, and having attended a lifetime of church brunches, I have definitely eaten my share of those. But mix a moderate amount of potatoes with healthy, colorful vegetables? I am all over that baby! Then there’s the cheese. You know what I mean, the casseroles drowning in ooey gooey cheese, shimmering with the oily film of dairy fat deliciousness. Those have their time and place, and I will happily devour way more of them then I ever should. BUT, I can’t do dairy protein right now because my sweet breastfeeding baby can’t digest it. Fortunately I can do goat cheese, and I can do heavy cream (which doesn’t contain protein). So I do! But both are optional if you can’t handle lactose or eating dairy free for other reasons. Oh, and if you are a breastfeeding mama, this casserole is an amazing meal for you! Not only is it easy to make , but if you make it just for your family, the leftovers will keep in the fridge for a week and you can easily eat a wedge of cold casserole in one hand while nursing your baby. I eat it like a piece of pizza during the morning nursing session. I love breastfeeding recipes! This casserole is easy to make and it’s easy to adapt. I used every vegetable and herb I happened to have available in my garden and fridge. I’ve tried it with sausage, I’ve tried it with ham, I’ve tried it with bacon, and even with no meat at all. It’s all good, and no one will know you didn’t follow the recipe exactly. Because recipes are meant to be guidelines. I believe it to be true and so it is. What most people love about this recipe is that it can be prepared the night before. Cook your meat (or chop it if you bought precooked ham or bacon), chop your veggies, whisk your eggs. Toss everything in a greased casserole dish and stick it in the fridge. The next morning you just pop it in the oven an hour before breakfast, AND YOU’RE DONE! That’s right. Your cooking that morning is no harder than remembering to turn the oven on and set a timer. That’s really helpful when you have a baby and a toddler and you aren’t sure if you’ll even be dressed by the time your guests arrive. Speaking of life with baby and toddler…we served this on Mother’s Day when we had both of our families come over for brunch before heading to church to have our baby girl Larkin dedicated. Since we had 13 people and I needed to be presentable to go onstage at church, I knew I could not be cooking that morning. So I made this with an build your own oatmeal bar (in the crockpot, also overnight, oh yeah!) and had someone bring bacon and someone bring fruit. Nice, easy, and a big hit. This casserole was GONE! A baby dedication, at least as our church does it, is simply going up in front of the church and saying that we are committed to raising our child to love Jesus, and then the people of the church say that they will do all that they can to help us in raising our children. It’s pretty beautiful and special, and we really saw it played out in the life of our son Corban when I came down with postpartum depression and the people of the church came around us to care for him during the times that I was unable to. So…beautiful…special…unless you’re a two year old boy who was told you get to go up on the stage where the drums and piano are but not told that you are supposed to just stand there quietly while pastors do boring things like talk and pray. It was pretty hilarious, as you can see. We got quite the workout, but everyone in the church definitely saw why parents of young kids can use help and support! We truly love our church family, and it was a pretty wonderful morning, especially with my best friend Kendra’s son getting dedicated along with Larkin. 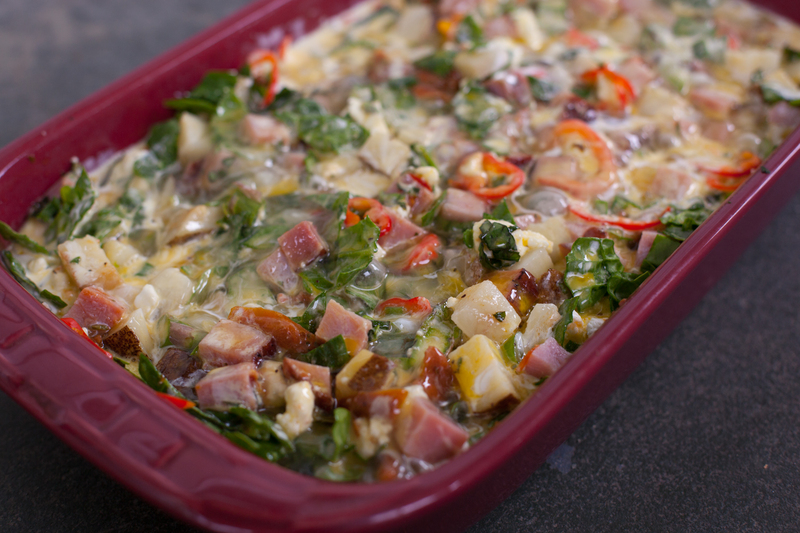 So give this casserole a try and know that you really can’t mess it up by swapping ingredients. The important things are to make sure that if you use a potato (or 4 small red ones) it’s already baked, to keep your veggies chopped small or sliced thinly so they cook evenly, and to get the casserole dish more than half full of filling ingredients before adding the 18 eggs. I should also mention that if a recipe ingredient says chopped or sliced without a comma (1/4 cup chopped herbs) then you measure it chopped. If it says chopped or sliced after a comma (2 cups raw spinach, chopped) that means you measure it and then chop it. This casserole is packed with garden veggies, full of flavor and protein, but has no dairy protein which makes it a hit for breastfeeding moms. It's also very easy to substitute ingredients depending on what veggies or meat you have on hand. Use the olive oil to grease 9x14 inch casserole dish. 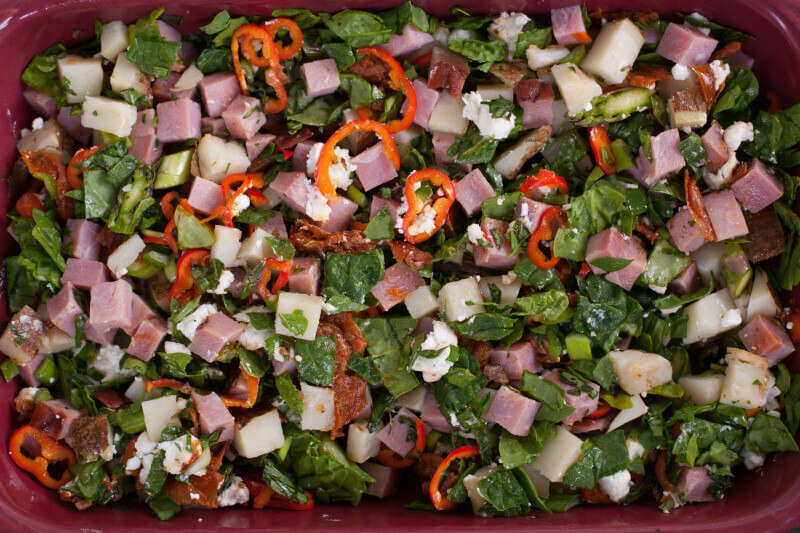 Put the chopped potato, asparagus, ham, spinach, bell pepper, green onions, tomatoes, herbs, and goat cheese into the casserole dish and carefully toss so everything is distributed evenly. In a large bowl, whisk the eggs with the cream, salt, and pepper. Pour over the ingredients in the casserole dish. At this point you can cover the casserole and refrigerate overnight, or cook it. When ready to cook, preheat the oven to 400 degrees F and bake for about one hour, until golden and firm. Approximate cost/serving: This is one of those recipes that is money saving because it keeps food from going to waste. Use up the leftover ham you roasted the other day, or the remnants of your veggie drawer. And eggs are cheap! I don't actually have a cost per serving for this because it was using up ingredients I had or got on sale, but it's a good deal if it's preventing waste! Gluten free: Yes it is! That looks delicious. 🙂 I’m always on the lookout for healthy and protein packed breakfasts that I can grab and take on my way to work. This looks like it would be great for that. Also, the picture above Mothers Day Brunch is so pretty! I love how it’s all laid out and all the colors. Beautiful flowers. Aww thank you so much Zoe! Yes I love how easy this is to eat on the go. 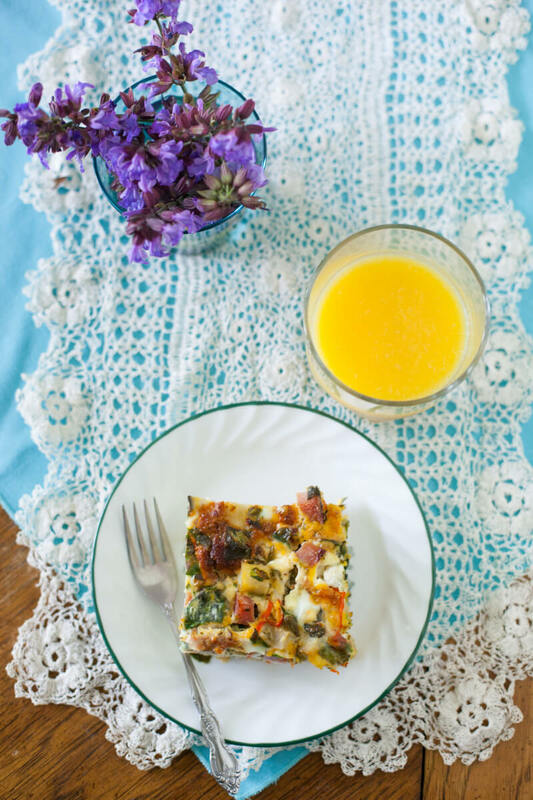 Loved the breakfast casserole recipe, thank you! You’re so welcome Cynthia, thanks for letting me know! Hi Sarah, so sorry for the SUPER late reply. I’m sure by now you’ve already figured things out. But for anyone else wondering the same thing, it was totally trial and error. Because sheep’s cheese, goat’s milk, etc. didn’t bother them, I knew it wasn’t lactose. That meant I just needed to watch the amount of dairy protein I was getting. A big issue with this is that a lot of products have hidden dairy protein through added whey. So you might be getting some without even realizing it. Not to worry though, this recipe is still wonderful without the heavy cream. Hope you and your littles are doing well!